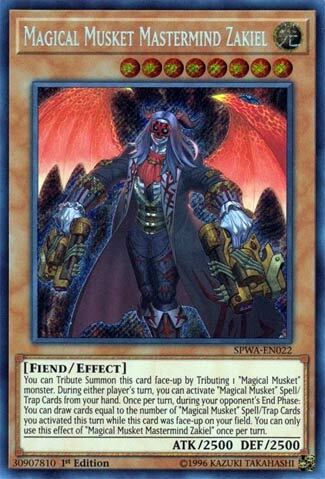 You can Tribute Summon this card face-up by Tributing 1 “Magical Musket” monster. During either player’s turn, you can activate “Magical Musket” Spell/Trap Cards from your hand. Once per turn, during your opponent’s End Phase: You can draw cards equal to the number of “Magical Musket” Spell/Trap Cards you activated this turn while this card was face-up on your field. You can only use this effect of “Magical Musket Mastermind Zakiel” once per turn. I love the double lore behind the Magical Musketeer archetype. Zakiel is the only high-level currently in the archetype, but is will only cost you one Magicial Musket monster to Tribute Summon. 2500ATK is pretty low for a Level 8 monster, but he makes that irrelevant. Draw power in the End Phase of your opponents turn proportionate to the number of Magicial Musket spell/trap cards you played while he was face-up will replenish your hand and thin your deck for the next turn. With traps that negate effects, protect your Magical Musket monsters from destruction, and spells that change the ATK/DEF of monsters on the field, and negate monster effects as well, the dual pistols Zakiel holds are appropriate. You want this guy on the field during your opponents turn so you can disrupt their plays and gain back cards off of it. It is a shame his effect isn’t during your turn as well. We now take a look at the Boss of the Magical Musket deck, Magical Musket Mastermind Zakiel. Say that three times fast. He has the Magical Musket Clause, cause I hope the Boss Monster would. He can be tribute summoned with 1 Magical Musket monster, thankfully because the deck struggles to spam the board without Ties of the Brethern. During the opponent’s EP, you can draw cards equal to the number of Magical Musket Spells and Traps used that turn while on the field. It is a hard once per turn. Thankfully it doesn’t have to be in his column, more draw power is good. The card is good, but I think it is a win more card. The monsters in the deck are mostly pretty good, you don’t need this, but I don’t think 1 will hurt. This is one of those cards you just want to love because of how sick the artwork is. So let’s look, 2500 attack (and defense) for Level 8, meh. Being able to be brought out by just one Monster in his family is good. Too bad that isn’t one of those Special Summoned with one Tribute clauses, but I digress. Yesterday we had limited Draw power, which was good certainly, in its own regard. This guy, if you can protect him (as he has none of his own) can benefit you massively. Each discard (as referred to and related to yesterday) gets you a Draw. This also is a once per turn, as I believe it should be here. He fits the theme well enough, but he doesn’t do as much as you might like the ‘boss’ Monster of your Deck to do.